Toradex invests around 85-90% of engineering resources on developing software that complements the robust and reliable hardware on its Computer-on-Modules. The end-result is an embedded platform, with hardware and software, optimized for power efficiency and high performance. 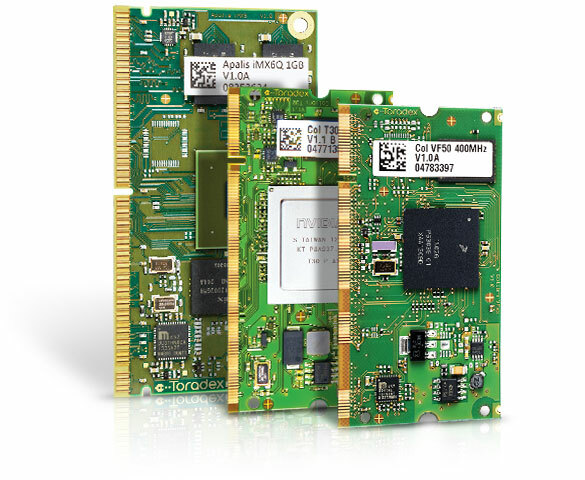 Toradex offers in-house operating system support for Windows Embedded Compact and Linux. Toradex images and Board Support Packages (BSPs) are highly configurable by design. This relieves the application-developer from the burden of creating a custom operating system image. The standard images and BSPs are all at production grade quality. Toradex provides free software libraries for additional features including camera interfaces, SPI, PWM, I2C, CAN and cloud connectivity. A full tool-chain for bootloader and operating system updates is also available for download. The software is constantly upgraded with free OS updates, bug-fixes and feature additions. Additional OS support, such as Android and eCos, is offered by our trusted 3rd party partners.